Reprinted from Beltway Poetry Quarterly, Vol. 17:2, Spring 2016, with permission of the author. 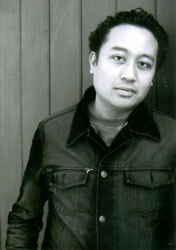 Regie Cabico is a spoken word pioneer, having won the Nuyorican Poets Cafe Grand Slam in 1993 and taking top prizes in the 1993, 1994 and 1997 National Poetry Slams. Cabico is co-editor of the anthologies Flicker and Spark: A Contemporary Queer Anthology of Spoken Word and Poetry (Lowbrow Press, 2013) and Poetry Nation: The North American Anthology of Fusion Poetry (Vehicule Press, 1998), and his work appears in the anthologies Short Fuse, Poetry Slam, The Spoken Word Revolution, and Full Moon on K Street: Poems About Washington, DC. He is co-director of the Capturing Fire National Queer Poetry Slam And Summit. Cabico was a featured poet at the 2016 Split This Rock Poetry Festival.